Godzilla is a mythological creature from Japan. He was based on a cross between Iguanodon, Stegosaurus, T-rex and dragon. 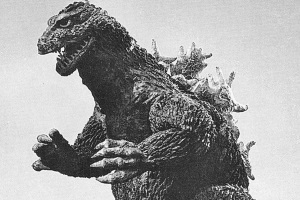 A reptilian monster with supernatural powers, Godzilla was born on the Ogasawara Islands near bikini atoll in 1954. His name in Japanese is Gojira. The first Godzilla film was titled “King of the Monsters” in the United States but was previously titled “Gojira” in Japan because of the monster’s Japanese name. In the first movie, Godzilla was just a reptilian aquatic dinosaur—until he was caught in an atomic bomb explosion. Radiation from the explosion gave Godzilla the ability to breathe a plasma beam from his mouth. The radiation from this explosion, caused Godzilla to become aggressive and kill thousands of people in Tokyo, trampling the city. When he returned to the screen in “Godzilla's Counter Attack,” Godzilla battled many monsters including Muto, Gamera, King Kong, Stay Puft Marshmallow Man, King Bowser, and Zilla. In the next movie, "Godzilla vs. King Kong," King Kong fought Godzilla. It also was a big success. Because of the success of his movies, Godzilla is the most recognized monster in the world.